Although diamonds won't fade or scratch easily, rhodium will. Pure silver is soft and pliable, which is why it's often combined with different metals, including copper, or plated with rhodium, a lustrous platinum metal that not only strengthens silver, but also protects it from tarnishing. Over time and if cared for improperly – including exposure to abrasive chemicals, ammonia or silver liquid cleaner – rhodium will eventually fade, requiring replating. Protect and extend the life of your diamond and rhodium piece by cleaning the metal and gemstone properly. Create a mixture of 3 cups cool water and 1 teaspoon mild dish detergent in a small plastic bowl. Stir the water to incorporate the dish detergent. Dampen the corner of a lint-free cloth with the soapy water. Wipe down the rhodium-plated piece using gentle, back-and-forth motions. For hard-to-reach areas, such as behind a setting, dampen a cotton swab with the mixture and gently remove any remaining dirt, debris or dried lotion. Rinse the rhodium piece under a cool tap. Dry the metal portion of your jewelry with a lint-free cloth. To clean the diamond, dampen a soft-bristled toothbrush with the mild dish detergent solution. Scrub the diamond vigorously with the soapy water. Avoid scrubbing the rhodium-plated silver with the toothbrush to avoid scratching. Dampen the corner of a cotton washcloth with water and wipe down the diamond to prevent soap scum residue. Store the rhodium-plated and diamond piece in a separate drawer or compartment in your jewelry box, or inside a small plastic baggie or velvet sachet. Whatever you choose, avoid storing the piece with other jewelry. Not only will other jewelry scratch or even remove the rhodium plating, the diamond could damage the other jewelry. 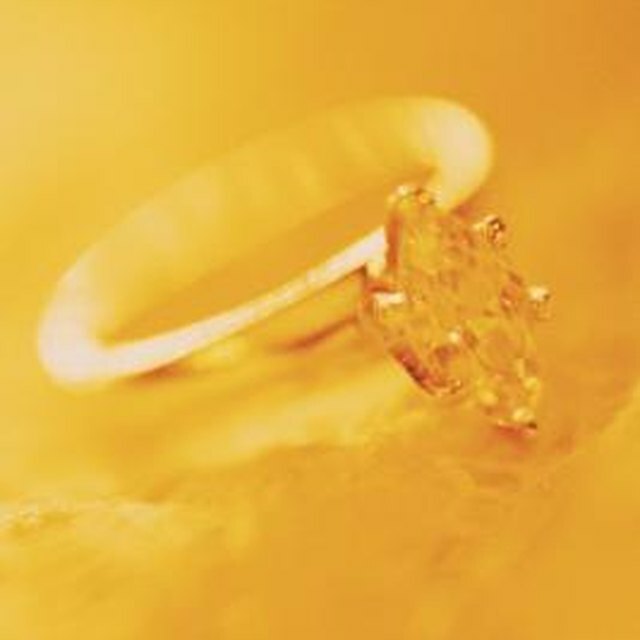 Never clean the rhodium-plated jewelry with silver polish or a silver polishing cloth. Both items can scratch or remove the rhodium plating.